At Island Tides BC Fishing Lodge our Vancouver Island fishing charters go where BC salmon fishing action is the hottest; the incredibly rich waters around historic Nootka Island, Nootka Sound, Tahsis and Esperanza Inlets. We are proud to offer our Vancouver Island fishing charter guests some of the best saltwater BC fishing adventures! When fishing with Island Tides BC Fishing Lodge, you will enjoy light tackle salmon fishing for trophy Chinook salmon (Kings) and Coho salmon (Silvers); playing tug of war with giant Halibut, Lingcod, Red Snapper and various species of rockfish. All saltwater fishing opportunities are available in the same day as our BC fishing lodge is located within minutes of all the best salmon fishing and halibut fishing grounds. For a special treat we usually pull our prawn traps on the way to the fishing lodge at the end of a great day on the water. A BC salmon fishing trip just does not get any better than this. All of our BC fishing charters are well suited for everyone. For novice anglers that are a little uneasy about fishing big open water, we have plenty of productive, calm, inshore water where we fish right along the kelp beds (where the big fish live and feed). Fly fishing enthusiasts may want to ask about our saltwater BC fly fishing charters from boat or shore for Pacific Salmon. 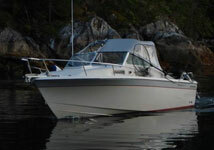 Fully equipped BC fishing boat, 22 foot cruiser with marine head, all electronics. All of our BC fishing trips are fully guided from 22 to 24 foot boats; piloted by insured, mature, experienced Vancouver Island fishing guides. Our fishing guides will ensure that you have a safe and memorable BC salmon fishing and BC Halibut fishing experience. Tell us what YOU want! At Island Tides BC Fishing Lodge we aim to please! 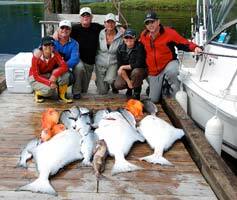 We offer a variety of BC fishing charters and packages. We have BC salmon fishing charters ranging from one day guided Vancouver Island fishing trips to 2, 3 and 4 day all-inclusive fishing charters. Our BC fishing charters include Salmon fishing, Halibut fishing and bottom fishing, deluxe accommodation and gourmet meal service. Let us customize a BC fishing vacation that works for you. We take care of everything! From our comfortable, well appointed, oceanside BC fishing lodge off the west coast of Vancouver Island to our friendly, experienced BC fishing guides we take care of all the details – you just need to show up ready to fish! 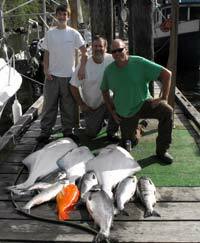 We can customize BC fishing charters to best suit your group size, schedule and your budget. It is all here waiting for you. So come and experience West Coast Vancouver Island and fine BC fishing. We offer you an incredible journey encompassing BC salmon fishing & halibut fishing, Vancouver Island scenery and west coast culture mixed into one fantastic adventure with Island Tides BC Fishing Lodge. Halibut, Lingcod, Red snapper, Prawns and crab. Trophy Chinook (king) salmon, Halibut, Lingcod, Red snapper, Rockfish, Prawns. All five species of Pacific salmon including Trophy Chinook (king) and Coho (silver) salmon, Halibut, Lingcod and Rockfish. Saltwater fly fishing opportunities. August All five species of Pacific salmon including Trophy Chinook (king) and Coho (silver) salmon, Halibut, Lingcod and Rockfish. Saltwater fly fishing opportunities. September Trophy Chinook (king) and Coho (silver) salmon, Halibut, Lingcod and Rockfish. Saltwater fly fishing opportunities. October Trophy Coho (silver), Chum salmon, Halibut, Lingcod and Rockfish. Please contact us for information about our freshwater fly fishing trips. Depending on the season, BC fly fishing for trout and steelhead can be combined with our BC salmon fishing and halibut fishing charters for a Steve Shelley “Grand Slam Fishing Charter”. Make this BC fishing trip the one to remember!